Take a tour of a simpler time. 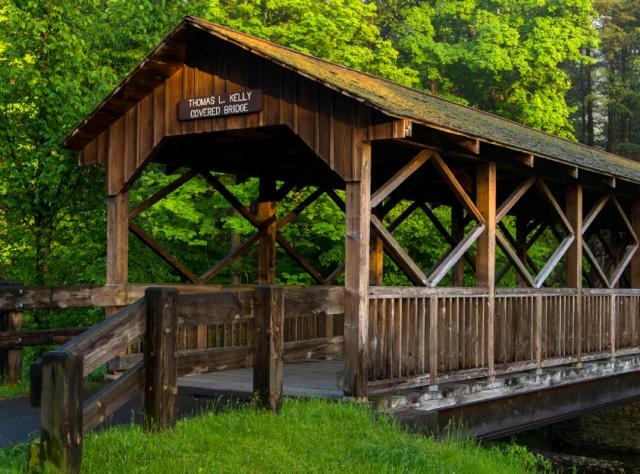 In charming villages and countryside across New York, more than 200 historic covered bridges stand as reminders of times past. Built between 1825 and 1912, most of New York’s covered bridges date back to the days of the horse-and-buggy. Saluted for fine engineering as well as charm, these historic bridges represent the ingenuity of our forefathers. Recapture the simple pleasures of a bygone era by visiting some of these historic treasures. Nearby, you’ll find farmers markets, fun events, museums and country inns. The 103-foot-long bridge at Livingston Manor Covered Bridge Park, near the Catskill Fly Fishing Center & Museum in Livingston Manor, spans the legendary trout stream Willowemoc Creek. Allow time to explore the museum, fish, picnic, or just enjoy the picturesque scenery and restored 1860 bridge. In the Capital-Saratoga region, the Five Bridges of Washington County stand within a 20-mile stretch between the towns of Buskirk and Salem. The landscapes here inspired popular folk artists Grandma Moses and Will Moses. Three of the covered bridges, built in the mid-1800s, span the Battenkill River, renowned for trout fishing, canoeing and kayaking. The Rexleigh and Eagleville bridges are still in use; the third now houses the Shushan Covered Bridge Museum. Next door, see a one-room-schoolhouse that was open from 1852 to 1943 and still has its 19th-century desks and books. The 1857 Buskirk Covered Bridge crosses the Hoosic River. Painted bright red, it’s easy to spot from a distance. Head to nearby Cambridge to walk through one of America’s oldest covered footbridges. Set in what is now Varak Park, this bridge spanning the Owlkill Creek was built in 1890 to provide access for workers of the Rice Seed Company. Across the street, the stately 19th-century Rice Mansion Inn offers 12 unique guestrooms and a gift shop specializing in local art. West Main Street also features shops, galleries and the Victorian-era Hubbard Hall, still presenting critically-acclaimed music and theater. Just outside the village, New Skete Monasteries sell divine cheesecakes! At Glimmerglass State Park in Central New York, you can cross Shadow Brook via the nation’s oldest covered bridge. Hyde Hall Bridge sits on the grounds of Hyde Hall, an 1817 country mansion called one of the most remarkable buildings in America. Nearby Cooperstown highlights classic Americana at the National Baseball Hall of Fame and The Farmers’ Museum.